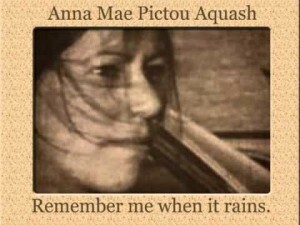 Anna Mae Aquash (also Anna Mae Pictou Aquash or Anna Mae Pictou; first name also spelled Annie Mae; Mi’kmaq name Naguset Eask) (March 27, 1945 – mid-December 1975) was a Mi’kmaq activist from Nova Scotia who became a prominent member of the American Indian Movement (AIM) during the early 1970s. 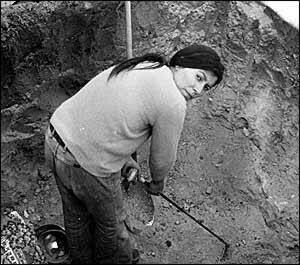 She was found murdered in 1976 on the Pine Ridge Indian Reservation, and is sometimes seen as a martyr of the Red Power and indigenous peoples resistance movement. She was born in Indian Brook 14, Hants County, Nova Scotia, Canada and was thirty years old at the time of her death. In Bar Harbor, Maine, Aquash became involved in the Teaching and Research in Bicultural Education School Project (TRIBES), a program designed to teach young Indians about their history. She soon moved to Boston where she met members of the American Indian Movement (AIM) who were protesting against the Mayflower II celebration at Boston Harbor by boarding and seizing the ship on Thanksgiving Day, 1970. Aquash was active in creating the Boston Indian Council (now the North American Indian Center of Boston). It was also at that time that she met Nogeeshik Aquash, from Walpole Island, Canada. They traveled to the Pine Ridge Indian Reservation together in 1973 to join AIM in the 71-day armed re-occupation of Wounded Knee, where they were married by Wallace Black Elk. Nogeeshik Aquash was her second husband. 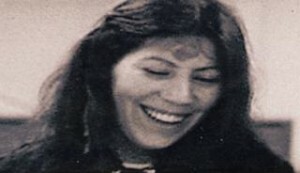 She was also involved in the 1972 Trail of Broken Treaties march on Washington, D.C. that led to the occupation of the Bureau of Indian Affairs headquarters, and armed occupations by AIM and other indigenous warriors at Anicinabe Park in Kenora, Ontario in 1974 and the Alexian Brothers Novitiate at Gresham, Wisconsin, in 1975. She was personally close to AIM leaders Leonard Peltier and Dennis Banks. She worked until her death for the Elders and Lakota People of the Pine Ridge Indian Reservation. Three years after Wounded Knee, and less than a year after the Shootout at Jumping Bull Ranch, on February 24, 1976, Aquash was found dead by the side of State Road 73 on the far northeast corner of the Pine Ridge Reservation, about 10 miles from Wanblee, South Dakota, close to Kadoka. Her body was found during an unusually warm spell in late February, 1976 by a rancher named Roger Amiotte. An autopsy was conducted by medical practitioner, W. O. Brown who wrote: “it appears she had been dead for about 10 days.” Failing to notice a bullet wound in her skull, Brown concluded that “she had died of exposure.” Although federal agents who had met Aquash were present at her autopsy she was not identified. Subsequently, her hands were cut off and sent to the Federal Bureau of Investigation headquarters in Washington, D.C. for fingerprinting. Her body was later buried as a Jane Doe.